First he had a full propane gas cylinder in his awning that was surplus to his requirements. This is now installed in my gas locker. The fridge works on gas ok and it is obvious that it will be useful if we ever have a power outage. It will give us an alternative for our heating and cooking as well as the fridge so it makes sense to have it as a back-up. He has loaned it to me for our five month stay here and it is now installed in my awning keeping my beer nice and cold. That sounds like a good solution until April. Is it a 3 way fridge ? If so it would be interesting to see if it runs off the car battery when connected for towing. It may help in narrowing down what the problem is. 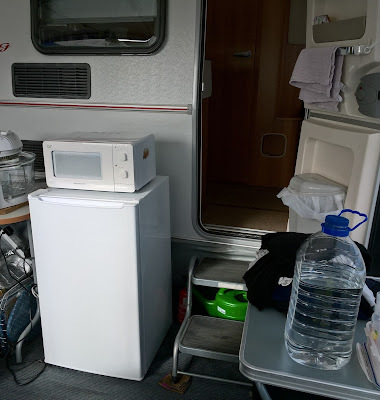 Yes it is a 3 way fridge....it works ok on both gas and battery when connected to the car with the engine running. Dave ( the dog) informs me that a 3 way fridge has a separate heating element for each function and an electrical check showed that the fault was with the 230v element. Trevor, I found an Eriba Manual at http://www.automotiveleisure.co.uk/files/Eriba.pdf I also found eribafolk dot com. That site has a good thread on Eriba fridge repair and running gear service. Finally, if all else fails, call the dealer where you originally ordered Eva and see if he won't talk your fixit guy through the process. One OTHER option: we just got a small fridge that will operate off the 12v battery power in our Subaru and will fit on the rear floor in between the front and rear seats. No freezer, but we'll be bringing some Texas Chili Bricks with us when we return to Ocean Shores early next year.